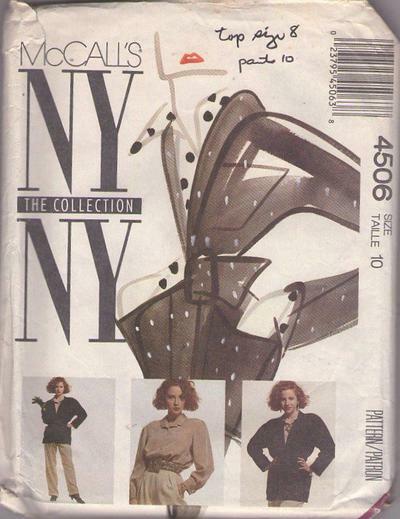 1989, 80s Avant Garde, Retro Petite Office Clothing Patterns - Misses' Lined Jacket, Shirt and Pants: Fitted lined jacket has shoulder pads, shawl collar, patch pockets and back darts and front buckle closure; long raglan sleeves have lower buttoned vents. Front buttoned shirt with collar has shoulder pads, front waistline gathers, back waistline pleats; long sleeves with attached yoke are pleated into buttoned french cuffs. Front pleated pants with front zipper opening and back darts (no waistband) have inset pockets and lower cuffs.